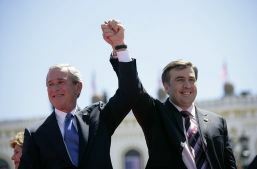 George Bush and Mikeil Saakashvili, Tblisi 2005. During the Olympic Games a truce or ekecheiria was observed. Three runners known as spondophoroi were sent from Elis to the various participant cities at each set of games to announce the beginning of the truce. During this period armies were forbidden from entering Olympia, wars were suspended and legal disputes and the use of the death penalty were forbidden. Although Mikheil Saakashvili has done little for the refugees since he came to power early in 2004 – apart from move them out of their hostels in central Tbilisi to make way for property development – he has spent 70% of the Georgian budget on his military. At the start of the week he decided to flex his muscles. The Israelis should be proud of themselves for the Israeli training and education received by the Georgian soldiers,” Georgian Minister Temur Yakobashvili said Saturday. Michel Chossudovsky:War in the Caucasus: Towards a Broader Russia-US Military Confrontation? US-NATO military and intelligence planners invariably examine various “scenarios” of a proposed military operation– i.e. in this case, a limited Georgian attack largely directed against civilian targets, with a view to inflicting civilian casualties. If the objective were to restore Georgian political control over the provincial government, the operation would have been undertaken in a very different fashion, with Special Forces occupying key public buildings, communications networks and provincial institutions, rather than waging an all out bombing raid on residential areas, hospitals, not to mention Tskhinvali’s University. The announcement by the Georgian Ministry of Defense on July 12 stated that they US and Georgian troops were to “train for three weeks at the Vaziani military base” near the Georgian capital, Tbilisi. (AP, July 15, 2008). These exercises, which were completed barely a week before the August 7 attacks, were an obvious dress rehearsal of a military operation, which, in all likelihood, had been planned in close cooperation with the Pentagon. The United States is carefully cultivating an opinion in Western capitals that Russia is “bullying” Georgia. This will strengthen Washington’s case for inducting Georgia into the North Atlantic Treaty Organization, which will in turn facilitate the deployment of the US missile defense system onto Russia’s border. If Moscow remains passive, the Caucasus could become its “bleeding wound”. Timeline and international reactions (wikipedia). Och även en psykofysiologisk förklaring= georgierna är ju rätt aggressiva i sin kultur med drickande och hyllning av satan med drickhorn utmed vägarna – och torn för släktskapsfejder som hållt på i århundraden.